Donna Garner is one of the foremost education experts in Texas. She has been fighting against liberalism in our Texas Public education since probably before I was born. Every elected official in Texas and anyone in the Texas education world knows Donna Garner. She fought for conservative State Board of Education Members when they were attacked. She fought against Common Core and CSCOPE. 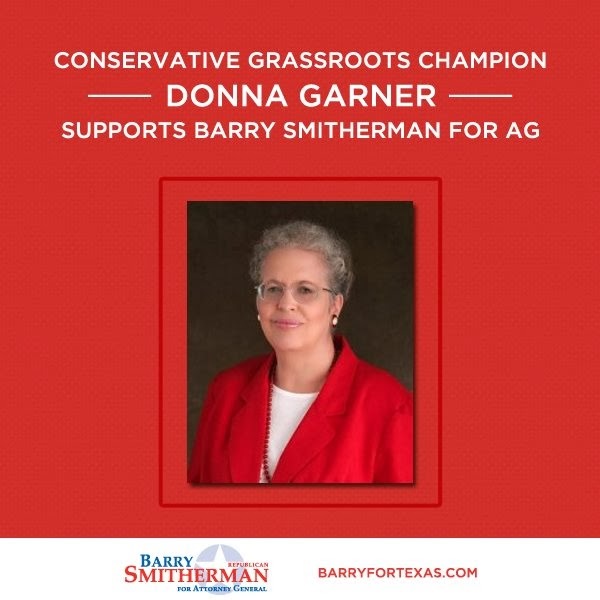 Donna Garner has endorsed Barry Smitherman for Texas Attorney General. Donna Garner sent out an email yesterday explaining in detail why she supports Barry Smitherman over Ken Paxton. Basically, the summary of what Donna Garner says is that she has been intricately involved in Texas Education and not once in the past decade has Paxton testified for or promoted any of the important conservative issues facing Texas education. Even when the conservative State Board of Education members were vilified by the media for standing for conservative values, Paxton was nowhere to be found and offered no help to the conservative SBOE members who were facing challengers in their elections. in fact, Paxton admitted to Donna Garner that he was supporting a moderate to the SBOE because she had given him large campaign donations. Donna goes on to say that Paxton did finally do something this past session by co-authoring a bill against CSCOPE, but then a recent recording surfaced of Ken Paxton stating that as Texas Attorney General he will probably not get involved in Common Core or CSCOPE.... that lackadaisical attitude towards defending Texas from Common Core is not something she wants to see from a possible future Texas AG. Donna Garner then goes on to explain what she supports Smitherman, who has clearly claimed that as Texas Attorney General he will fight Common Core from coming into Texas. WHAT ABOUT KEN PAXTON FOR TAG? Then there is Ken Paxton. I actually endorsed Ken for the TAG early-on when called by his campaign staffer. At that time I knew many negatives about Dan Branch but almost nothing personal about Barry Smitherman, the Texas Railroad Commissioner. I knew that Ken was a pro-life, pro-family-values conservative; and I had worked hard along with many other conservatives leading up to the 82nd Legislative Session to help him to become the Speaker of the House instead of Joe Straus. Unfortunately, Ken took his name out of consideration at the very last minute, leaving us without a conservative champion to support. I decided to endorse Ken for the TAG but in doing so I had to overlook the personal conversation in which I learned that he supported a moderate for the Texas State Board of Education simply because she had given his campaign large donations. I also had to swallow my deep emotions over the fact that Ken along with the other Texas Legislators had passed HB 5 and HB 866 which basically gut the authentic education reform that we conservatives had fought for 15 years to establish in Texas. As Ken came out yesterday with strong statements about what a stalwart he has been on education issues, I have done some reflecting on my own. During the years 2005 – 2012 in which the Texas State Board of Education conservatives were fighting against all odds to adopt Type #1 curriculum standards (TEKS) for English/Language Arts/Reading, Science, Social Studies, and Math, I do not think I can remember a single time when Ken Paxton’s name was mentioned. 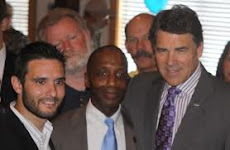 I cannot remember that he ever testified, wrote a public statement, came out with editorials in support of the SBOE’s efforts to put Texas on the path to authentic education reform with the 4 x 4 graduation requirements and Type #1 STAAR/EOC’s. Nor can I remember his authoring or helping to pass legislation to try to rescue the SBOE conservatives from vilification by the media, Democrats, and the RINO’s. In fact, so far as I can remember, Ken was nowhere around when the SBOE needed his public support during those very difficult years. It Ken was concerned enough to co-author HB 462 that supposedly banned Common Core Standards in Texas, how could he possibly have muddled his answer so badly on Nov. 18, 2013, when the question was asked him regarding Common Core Standards during the TAG campaign event? (Please listen to either of the audio clip attachments.) I do not think that Ken’s lackadaisical answer sounds like the type of response that the committed and impassioned people who signed his endorsement letter yesterday would have said. I believe that if any of them had been asked the same question Ken was asked about Common Core Standards, these people would have answered back with a diatribe of all that is wrong with CCSI. I have it on record that when Barbara Cargill was contacted by Ken’s campaign on 11.22.13 after my article had surfaced, she was driving home from an arduous four-day Texas State Board of Education meeting in Austin. Barbara had not read my article at that time because she had been so inundated with chairing the SBOE sessions. I know that she and Ken have been friends for some time and that she had no idea what came out of his own mouth on Nov. 18, 2013, when asked about his position on Common Core Standards/CSCOPE if elected TAG. Whether that would have changed her endorsement of him, I cannot say. In contrast to Ken’s weak answer on the Common Core/CSCOPE, how did Barry Smitherman answer questions about education issues and the positions he would take as the TAG? 9.30.13 – “Letter to Daughter’s Teacher: Intolerance in American Study” -- http://nocompromisepac.ning.com/profiles/blogs/barry-smitherman-s-wife-interviewed-women-on-the-wall-9-30-13?xg_source=activity -- (This article contains Barry Smitherman’s letter to his daughter’s teacher in which Smitherman explains his concerns over a worksheet provided by the Southern Poverty Law Center when the class was studying To Kill a Mockingbird. The SPLC is the organization that continues to label tea party patriots, constitutionalists, Family Research Council, Texas Eagle Forum, Concerned Women for America, and many others as either a "hate" group or "right wing extremists.” Barry Smitherman makes it very clear that the SPLC worksheet has no place in Texas schools. Ken Paxton is a fine Christian fellow; and I applaud him and the other Legislators who fought for pro-life bills in the Legislature. However, Barry Smitherman is a strong conservative Christian also. People who know him and his family well and who are respected conservatives themselves have testified to this. Barry Smitherman – former Harris County prosecutor (Assistant District Attorney), service on the Public Utilities Commission (PUCT) where he also served as Chairman, heading up two large state agencies (2004 – present) plus 17 years in the private sector working in public finance, has sued the EPA 7 times to protect Texas oil and gas. The usual talking points against Barry Smitherman are (#1) he has no voting record, and (#2) he supposedly brought Smart Meters into Texas. On point (#1), what about our Texas Hero Ted Cruz? He had no voting record, but we all know his strength of commitment which he carried right into the Senate and The Beltway. On Point (#2), if voting records are so important, then what about the voting records of Ken Paxton and Dan Branch? Dan Branch co-authored Smart Meters legislation. Paxton actually voted twice for the implementation of Smart Meters and directed the Public Utilities Commission to allow the utilities to charge a fee for installation. Paxton also supported a provision that required the PUC to report to the Legislature on the utilities progress in installing Smart Meters. If both Dan Branch and Ken Paxton felt the Smart Meters were such an important issue, why did neither of them address it during the 83rd Legislative Session? To be honest, if the Texas Legislature had not passed the Smart Meters bills in the first place, we would not have them in our state. The PUC agency did not step outside its boundaries and make law; the PUC’s job is to implement whatever the Legislature passes. In fact, if Smitherman as chair of the PUC had “made” the Smart Meters laws, he most certainly would not have been re-appointed by the Texas Senate in 2007 and reconfirmed in 2009. That is the checks and balances process on the PUC by the TX Senate, and Ken Paxton was in the Senate when Smitherman was confirmed. Now to be fair to all three men (Smitherman, Paxton, and Branch), back when Smart Meters were first introduced, the public did not widely know of any potential health hazards; and we did not know that Obama would be able to usurp state sovereignty and take complete control of our country. We did not have to fear the federal government as we now do under Obama. Unfortunately, because of the newly released information about the NSA data collection, the IRS targeting of conservatives, and the total takeover by the federal government of our healthcare system through ObamaCare and our public school education system through ObamaCore, Americans now understand that Smart Meters could be used by the Obama administration to control our personal lives. *To clarify yet one more myth about Smitherman, he has told me that the only time he visited the White House was under President G. W. Bush and that Smitherman has never even met with Obama.